An introduction to our three styles of organic mattress toppers. Dominick describes the advantages of each. 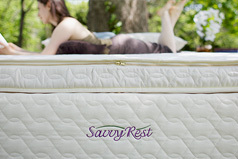 At Savvy Rest, we are known for our GOTS-certified, customizable latex mattresses that are made with your comfort in mind. However, today we’d like to talk to you about that extra touch of luxurious softness that a topper can provide. Each of our toppers are made with natural materials that are safe for your home. 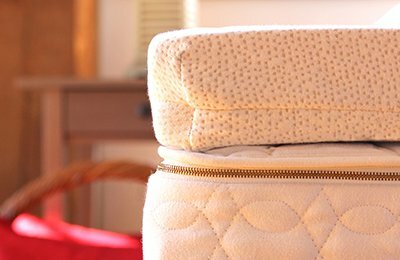 If you like a gentle, cradling feeling as you doze off to sleep, a topper is a must-have for you. We have several options to choose from. Let’s take a look. The Harmony Topper is GOTS-certified and closely resembles our layered latex mattresses. 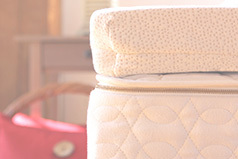 It includes the same organic Savvy Rest casing, made with organic cotton and organic wool batting. Inside the casing is a 3-inch layer of latex. Choose between certified organic Dunlop or Cradle to Cradle Gold certified Talalay. Our most popular latex choice for the Harmony Topper is Soft Talalay because of its pressure-relieving qualities. If you’re looking for an option that is a bit denser, we recommend Soft Dunlop. Think of Talalay as angel food cake and Dunlop as pound cake--it all comes down to what feels best to you! Our other latex topper is the Vitality. The Vitality includes a 3-inch layer of Soft Talalay latex that is covered in an organic cotton knit casing. The casing stretches and hugs the latex, perfectly contouring to your body and allowing you to really experience the soft, buoyant feel of Talalay. If you’re looking for excellent pressure relief the Vitality is for you. Our final topper is the Organic Savvy Woolsy. This GOTS-certified topper is a wonderful option for anyone who prefers wool. Wool promotes air circulation and if you tend to sleep “hot,” this topper will help you feel more comfortable at night. Wool will keep you cool and refreshed in the summer but cozy and warm in the colder months. The Savvy Woolsy is also a popular choice for people with back pain. If you suffer from back issues, it’s important that you have the support you need without sinking into your mattress too much. The Savvy Woolsy gives you that touch of softness without sacrificing support, so you can have the best of both worlds. We also offer a Natural option of the Savvy Woolsy. It is made with the same organic cotton sateen fabric, but includes domestically-sourced natural wool. I hope one of our toppers has stood out to you and that you decide to give it a try. Sleep well and thanks for watching! A handy primer on how to choose the best mattress topper for you. Add extra softness to your mattress with these organic mattress toppers.